But going through organizational change is one of the few guarantees in the business world. Every organization must change over time – to adapt to fluctuations in the marketplace, to capitalize on new ideas and technologies, to make improvements, and to adjust to internal and external circumstances. But people don't like change. Change means uncertainty and loss of control. It can mean unwelcome surprises and the feeling that everything is unfamiliar. Change can mean job loss, unwanted moves, concerns about competence, and loss of dignity. Organizational change often means more work for the same pay. At least, that's how people feel when organizational change isn't managed well. And change often isn't managed well. From the 1970s to the present, studies have shown that organizational change projects fail at a rate of 60-70%. There's no way to completely eliminate discomfort during times of change – but the right change management strategy can at least help people get through it. A healthy change management strategy ensures that organizational change is smoothly implemented and that the beneficial goal of the change is achieved. In fact, Dr. John Kotter came up with an 8-step process for leading organizations successfully through change. You can download our exclusive guide for internal communications professionals right here. Change doesn't happen in isolation. It impacts the whole company and all those who interact with the company – including partners and customers. Even though the effects of change ripple outward through teams and departments, all the way to end-users and customers, change management is ultimately about people. People who are affected by the change, and who will implement the change. People who have emotions, feelings and personal connections. The success of organizational change lies in the reactions of those people. So communicating the change, the goals and benefits of that change, and the roles employees are expected to play in that change becomes critical. This is why internal communication is the key to success during times of change, and why internal communications managers play the most important roles. The key to successful change management: Internal communications. Saying that internal communications managers have an important role in moving employees and teams smoothly through organizational change is actually an understatement. Without the right communications, employees become uncertain and negative. They aren't able to see the benefits of the change, or even understand the purpose of it all. Communication impacts employees' reactions – and because of this, it can determine the outcome of the change. The most effective practice in organizational change management is effective communication plans, according to a survey from Statista. In second and third place, respectively, are effective execution of the communication plans and effective identification, measurement and communication of the intended benefits of the change. So why do so many change initiatives fail? Communication may be to blame, there, too. Or more specifically, lack of communication may be to blame. Communications professionals and leadership have a hard time delivering tough messages. Messages aren't delivered at the right time. Messages aren't delivered in the right formats or through the right mediums, so employees miss them entirely. Communications aren't delivered by the right people. For example, a message is delivered by HR that would have been better received if it had been sent by a member of the leadership team. What we've seen time and time again, too, is that employees get confused by a barrage of contradictory email messages. The manager says, "Follow this new process." The executive says, "Put your customers first, no matter what." Clear communication is the only way to keep everyone on the same page. The objective of the change needs to be clear to everyone. Internal communications managers have a pivotal role in this. Bonus: Pick the right communications tool for the job with this handy guide. Internal communications are vital through each step of the change curve. Employees are going blind to formal presentations and "propaganda" about the latest new-and-improved strategy to overcome the company's most recent challenges. Change fatigue runs rampant in many organizations today, and change management programs often fail to connect to affected employees on an emotional level. This leaves employees feeling like "change" isn't a very positive thing. Like grief, going through major change at work involves an emotional journey. Psychiatrist Elisabeth Kubler-Ross came up with the Change Curve, which maps the emotional stages that most employees go through during times of change. The right communications are vital through every part of the change curve. Here are best practices for getting the right message out in the right way at the right time. Denial phase — People need information. When a change is first announced, employees often react with shock or denial. This isn't surprising, since the comfortable, familiar status-quo is about to go out the window! When reality begins to hit, however, people need to understand what's happening. They need information. A Towers Watson study discovered that while 68% of senior managers say they understand why organizational change is happening, the number falls from there. Only 53% of middle managers really get the message, and 40% of front-line supervisors understand the change. If management doesn't understand why the change is happening, how can it be communicated consistently and clearly to employees? The answer is, it can't. So in the Denial phase, this is where internal communications managers should focus a lot of their efforts. Ensure your team members are coordinating with management to produce consistent messages that clearly communicate the change. Post communications, announcements and updates on team intranet homepages. A company intranet is a power tool for internal communications. Posting important messages here will make it easy for employees to receive this vital information and find it again later. It creates a searchable internal communications hub and completely bypasses overstuffed email inboxes that often delay important messages. Clear the path to two-way conversation with online forums. You might think that discussion forums are a little old-school – but you will be surprised at how powerful they are during times of organizational change. When employees can talk publicly (or in a closed group) about their feelings and experiences, or ask their leadership questions and actually get answers, it helps them feel like they have a voice in the change. Resistance phase — People need support. In the second phase, people are coming out of their shock and beginning to react. This is often thought of as the emotional "danger zone." In the Resistance phase, employees begin to feel anger, resentment and fear – and they resist the change. Of all the phases, this might be the one that internal communications managers should plan most carefully for. Help communications personnel and team managers prepare for the inevitable push-back with a pre-mortem. That is, get together and think through the feedback and objections that employees are most likely to come forward with – then prepare responses. This coordinated effort will result in more consistent messaging and better support for concerned employees. Let's take a minute to address the issue of message cascades, here, too. Especially in larger companies, cascading communications down the chain from senior executives to senior managers all the way through to individual contributors can be an efficient way to get information out. The problem is that at each link in the chain, the message can be changed, edited or lost completely. As the internal communications manager, take the lead here. Empower managers and supervisors to reach out to your team members to help craft messages, or even just to get a second set of eyes. That way messages are filtered through one point – the internal communications team – and they can be reviewed for consistency, thoroughness and tone before going out to anxious employees. Internal communications managers can also help employees more directly in the Resistance phase. Your social intranet software can be a great place to provide support for individuals while keeping everyone on the same page. Encourage employees to reach out through instant messages or group chats. If you communicated the right information in the Denial phase, then employees will know who to go to when they have questions or concerns. Where many organizations get in trouble is that employees send emails to the right people – but those emails never get read. They land in crowded inboxes and get lost in the sea of unread messages. This leaves employees feeling ignored – and worse, resentful. Keep everyone communicating with online group discussions. Discussion forums work great in the Resistance phase, too – though the purpose might be a little different. In the Denial phase, people need information, but in the Resistance phase, they need support as their emotional response to the change really begins to kick in. Like instant messaging and chat, online group discussions bypass cluttered inboxes and give employees a voice. Unlike those conversational tools, though, the conversation isn't expected to be in real time. This is a great opportunity for your internal communications team to tap into those prepared responses and provide supportive and helpful answers in the discussion forums. Exploration phase — People need direction. The Exploration phase is often the positive turning point for organizations going through change. People have processed the bulk of the negative emotions, and they begin to accept the change that's happening. In this phase, employees need to be able to explore what this change means for them, personally. Understanding how their roles will be changing, and how they fit into the company's bigger picture, becomes extremely important. While individual contributors need extra support in the Resistance phase, they need clear direction in the Exploration phase. Training is a critical area for employees, here – so communicating training opportunities and making sure documentation is readily accessible are important tasks for internal communications teams. Because employees are exploring their "new reality" in this phase, and possibly even learning new skills, productivity may drop off a little. This is normal, and nothing to worry about. With the right support, direction and tools, productivity will pick back up in the fourth and final phase. Help employees keep track of the tasks they're charged with during the change with task- and project-management software. Now that people are exploring their new roles and responsibilities, they have new tasks and projects to keep track of. Arm them with top-notch productivity and collaboration tools – and combat the natural loss of productivity during the Exploration phase by making sure those productivity tools work together. Having one tool for task management, another for team communication, another for scheduling, and another for project management is a recipe for chaos. Look for an all-in-one productivity suite like Communifire that can help employees stay on-track with their responsibilities and get quick access to vital communications (minus that pesky email). Store training materials and documentation in a centralized location. Training and direction are especially critical during this phase – and so there is also a greater need for knowledge management. Create a centralized location within your company intranet to house the files, documents and other helpful content that employees will find useful as they explore their new work world. Commitment phase — People need encouragement. Even though attitudes begin to shift during Exploration, the Commitment phase is often the most exciting and productive phase of all. This is when the change has been fully embraced and it has become a natural part of everyday work-life. Employees have changed the way they work, and everyone is starting to see the benefits of it. Productivity climbs and efficiency is the name of the game. It's an exciting time. But leaders are not out of the woods, yet! People still need to see executive involvement in this final phase on the Change Curve. At this point in the process, internal communications managers can help by guiding executive leadership to communicate openly about their belief in and commitment to the change the organization just underwent. Employees need to hear that everything they just went through was for a good reason. It's also important that senior management and middle-management continue to openly communicate through the Commitment phase. Once again, the internal communications manager has an important role in urging management to communicate, and crafting and/or reviewing those communications. Remember, employees can sense insincerity from a mile away. These communications should not be lip-service – they should be encouraging and inspirational. Messages now should celebrate successes and achievements, and showcase how far everyone has come. Though email is still a common way to get these encouraging messages out, it's not the most effective form of communication anymore. The average email open rate for internal communications is a sad 48%. Instead, place these messages where employees are already spending focused time – on the team intranet. Publish encouraging and inspirational blog posts, photos and videos. Internal communications professionals and leadership teams can channel their inner cheerleaders in the Commitment phase. Now is the time to really encourage and motivate employees with positive messages about how far they've come, and how they have helped the company reach its goals. And remember, corporate speak won't do you any favors when it comes to connecting on a personal level. Use a conversational (yet still professional) voice to really improve the relatability of these types of communications. Create events that bring people together for some positive interaction and team-building, and post the details on the team intranet to get everyone excited. Today teams are often virtual – with people at different locations or working from home through your digital workplace software. Bringing everyone together for team-building events can really help maintain the positive momentum of the Commitment phase. Posting about the event on the team intranet is an easy way to communicate the details. But if you use a tool like Communifire, everyone can also discuss the event right there on the event page, share tips and experiences in the comments, and even upload photos and videos to document their fun. Successful change management requires communication. Internal communications managers play a critical role in change management. In fact, successful organizational change cannot happen without the right communications. During times of change, communication should really ramp up. Don't worry about over-communicating. It's much harder to over-communicate than it is to under-communicate – and the consequences of under-communicating are much more dangerous to organizations. Internal communications get the word out. They guide employees through change. They encourage people when times get tough. But maybe more importantly, they nurture healthy conversation. Internal communications build bridges between employees and leaders. With the right communications tools at your disposal, you have the power to help your company achieve its biggest successes. Next step: Embrace your role as a change leader and grab your power tools. 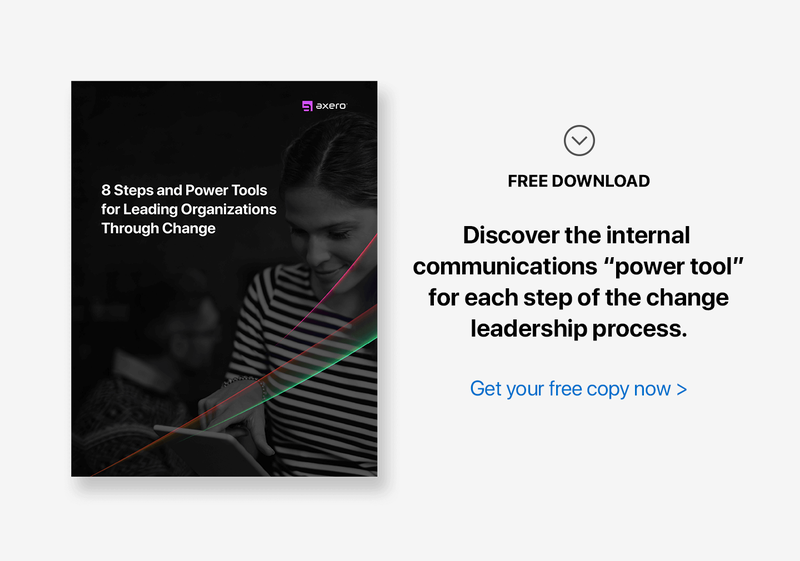 As leaders guide organizations through change, internal communications play a pivotal role, every step of the way. We've created an exclusive guide for you so you can step up to the plate with confidence.